Lincoln Brewster is one of my favourite worship leaders, and worship artists. Maybe within the top 5 ever. There. Period. Maybe up with others like Paul Baloche, Tim Hughes, Meredith Andrews and Phil Wickham to round out the top 5 favourite worship artists of all time (solo artists that is, with worship band Delirious? being my favourite worship band ever! )… so sorry Chris Tomlin, Lincoln just nudges you out… no seriously, Lincoln’s worship is certainly underrated. Possibly one of the most energetic and enthusiastic guitarists around ever, surpassed only by Stu G., guitarist of Delirious? Lincoln’s passion for worship is shown in any album he records. And while it’s been around 4 years since his pop-electronic-worship album Oxygen (and four years prior since the 2010 album Real Life), Lincoln’s passion for worship and his heart to create and present to us heartfelt songs that stir up a passion for worship, has never wavered. Known for his church and radio favourites, from ‘Today is the Day’, ‘There is Power’ and ‘God You Reign’, to ‘Let the Praises Ring’, ‘Sinking Ships’, ‘Oxygen’, ‘Made New’ and ‘Majestic’; much of Lincoln’s music catalogue are both catchy and heartfelt, alongside it being grounded in biblical scripture and the Word of God. And while I reckon that is what all music for the church should be, grounded in the Word, sometimes we get some songs that are just a little bit more theologically firm than others. Not to have an attack on worship music in general, it’s just that Lincoln and his music has always been special for myself and my own spiritual growth. Since walking away from a mainstream music career when he was young in his twenties, Lincoln has since proven to be a reliable worship artist, as we see time and time again, songs that tug at the heart and challenge the listener in their own walk with Christ. Much of his new album God of the Impossible– 11 tracks for the standard version and 15 for the deluxe, inclusive of 3 acoustic songs and an instrumental track, is no different. 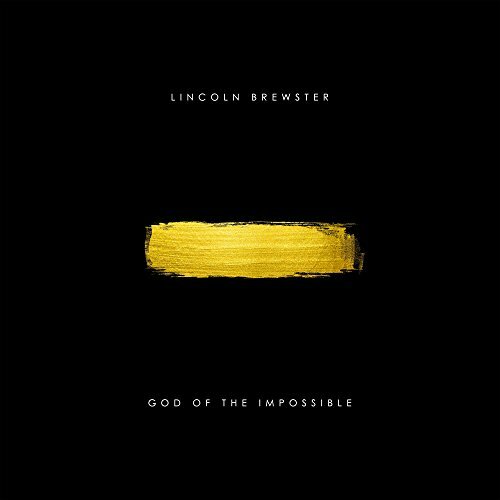 Both ‘No One Like Our God’ and ‘Here I Am’, are songs that released as singles prior to the album release date in May 2018, and these tracks have become standouts on not only God of the Impossible but also standouts throughout Lincoln’s career as a whole. Released in September 2017, Lincoln gives us ‘No One Like Our God’, a song that is fit for the church as we see one of the most enthusiastic worship leaders return with a melody that has become a fan favourite amongst churches around the world and Lincoln Brewster fans since its debut last year. While at times his musicianship style differed to suit the CCM/worship musical landscape that dominates the song (therefore, there was no guitar solo when the song debuted way back in September 2017, but since the release, an outcry occurred and therefore, Lincoln recorded a new version of the track with a guitar solo, released on this album in its entirety), Lincoln has invited us to become a part of a track that I reckon will take the CCM/worship industry by storm in years ahead. Just as songs like ‘Great Are You Lord’, ‘Ever Be’, ‘The Lion and the Lamb’, ‘What a Beautiful Name’, ‘O Come To the Altar’ and ‘Good Good Father’ have invaded our churches, our hearts and our homes in recent years, so too I reckon ‘No One Like Our God’ will both now and in the future. A praise song through and through, ‘No One Like Our God’ presents to us this theme- that there is no one, nothing in heaven or earth, no other person, that can fill our hearts, minds and lives as Christ Jesus. There is nothing like Him and there won’t be anything like Him again. He is our hope and future, our Salvation and comfort. And Lincoln conveys this truth very much with passion and encouragement. And while the song itself falls prey to repetition in the chorus, all can be forgiven once we hear the enthusiasm Lincoln has delivered, alongside the guitar solo that fits very nicely with the song in general, as we’re reminded maybe even daily, that ‘…what is this love that won’t relent, that’s calling out with heaven’s breath, who’s reaching wide to save our souls, only You, what is this grace that makes no sense that we could never recompense, who gives us all a second chance, only You…there is no one like our God…’ ‘No One Like Our God’, in a nutshell, is a refreshing, heartfelt, emotive and poignant look at how there is literally no one like our Father and Friend, Redeemer, Healer, comforter, counsellor and Saviour. The song will bless whomever listens to it, even though on the surface, it can seem like more of a trademark CCM track than the original Lincoln Brewster flair his previous tracks had. ‘Here I Am’ also continues the passion and enthusiasm that was initially started in ‘No One Like Our God’- released in February 2018, this song does have a guitar solo from the outset, all within the confines of its 4:19 song length. The song is a simple one at its core. To be titled ‘Here I Am’ can seem a little lazy on face value if you were to think of a title of a song, especially when there’s a famous song by Tim Hughes called ‘Here I Am to Worship’, as well as Michael W. Smith’s lesser known yet still famous track ‘Here I Am’ way back on his 2004 album Healing Rain. So for Lincoln’s new song to be titled ‘Here I Am’ can be forgiven to be initially thought of as a track that is seemingly written on a whim, and the title of it given as a second thought. Yet in reality, ‘Here I Am’ is anything but an afterthought. The song itself is seen as one of surrender, not because we are weak, but rather, because we are so desperately in need of Jesus to come take control over our lives, over the parts where we can’t fix because either it’s too ugly, or too tiresome to change. Through Lincoln delivering the heartfelt and emotive first verse, that ‘…You’re not asking for perfection, You’re not after flawless prayers, all You’ve wanted from the start, the surrender of my heart…’, we are reminded that as we come to God, we can be just as we are, taking down our facades and masks as we unveil our real selves without judgement or condemnation. A song of surrender, ‘Here I Am’ hopefully encourages us to unveil our true selves knowing full well that the Lord our God won’t judge us, but will in fact use what we call weaknesses to remind us that even the broken can be impacted and changed by the Father, as much as those who seemingly have it all together. The statement ‘here I am’ in any case is to show our selves and not be looked down upon in the process. God’s love bypasses all our own judgements and preconceptions; and gives us grace to declare to the Lord ‘here I am’, with all our baggage and things we don’t necessarily want our family or even God to see! Throughout the rest of the album, we see a variety of themes discussed by Lincoln, all the while being presented through the lens of his enthusiastic guitar work that has trademarked his songs in years gone by. Even his acoustically driven melodies (songs 12-14) and his instrumental track, all on the deluxe edition, have his trademark guitar skills and passion that has set him apart from almost every other worship artist in the modern era. ‘Deep Down (Walk Through Fire)’ is the first song on the album, and with a heavy guitar presence, and a radio friendly atmosphere that could potentially work in the song’s favour if it wants to be a radio single in the near future, Lincoln presents to us that, deep down in our spirit and soul, when every façade is stripped away, we as humans and as Christians, ought to really know that God is for us, in spite of what our circumstances say. That deep down, this is what we believe, that ‘…even when I walk through fire, I won’t be burned, I’ll set my feet upon Your word, I know Your love will never fail, this I know now, deep down…’ Lincoln’s acoustic version of the song is also available on the deluxe edition, and for me, I felt that rendition was in some ways much more raw, unfiltered, sincere and even passionate compared to the layered EDM-style version that is the first track. For some, the studio version would be the one that they resonate with more, and that’s ok. Lincoln’s new side shown through the acoustic renditions is a good thing, as evidenced through ‘Deep Down’. ‘Your Love is Amazing’ is one of the songs on the album that can easily fit in a Sunday morning worship service, and is, by far, one of the most lyrically ‘generic’ sounding songs that Lincoln has ever done. Despite this drawback, and the repetitious chorus, we can’t deny the passion that Lincoln exudes in this track alone, thereby negating some of the lyrical moments that seem to pale when comparing this song to various others on the album. Nevertheless, ‘Your Love is Amazing’ can certainly work in a Sunday morning worship setting, therefore, the song set out in achieving what it intended to do- facilitate people into corporate worship. ‘Turn It Around’ continues to rely on repetitious chorus hooks to draw in people in a potential corporate worship-style setting, yet for a song in its own merit, compared with others of the past and others on this album, ‘Turn It Around’ sadly can’t be saved…nothing against Lincoln himself, its just that with a repetitious chorus, and a message that can and has been shown and depicted in another similar-titled song ‘Turn Around’ by Matt Maher, years ago, Lincoln’s melody, though impressive musically with all the guitar work, seems to be just that- fancy guitar work. Though the lyrics are indeed true, the song hasn’t drawn me into a place of worship…yet. Maybe in the future though. ‘Loyal’, ‘Amazing God’, ‘Higher’, and the title track ‘God of the Impossible’ form the bulk of the middle section of the album (‘Loyal’ also is present as an acoustically driven rendition, which is also, in my opinion, the better choreographed version of the song), and each song present a necessary theme that is needed much in society and within the church right now- ‘Loyal’ encourages us to see God as just that- loyal to us and standing steadfast despite however we feel or even believe about situations we experience, while ‘Amazing God’ creates a space that allows us to marvel and be in wonder of God’s amazing qualities, that He is ‘…clothed in everlasting wonder, mercy streaming from Your throne, brighter than all heaven’s splendour, You are amazing, God…’ Aside from the guitar solo that was added onto ‘No One Like Our God’ when the full version came out on this album, the guitar solo on ‘Amazing God’ is perhaps one of the most impressive out of any guitar solo on this album (aside from the instrumental track ‘Relativity’ of course!). ‘Higher’ gives us a moment where we are aware of all the reasons why we lift God higher, because ‘…at the sound of Your name, heaven sings of Your fame, forever mercy fall on us, marvellous, is what You are, majesty, You’ve won our hearts, there is no one greater, O God…’, in a track where the verses are full of lyrical ingeniousness, coupled sadly with a chorus that, though very much true, seems to lack a lot of ingenuity (nevertheless, ‘Higher’ as a whole still has a radio feel and I wouldn’t mind it to become a radio single in a future setting); while the title track, though a lot of repetition in the chorus, doesn’t bother me one bit, as this song reiterates the fact that God is a God of the impossible- changing things that seem to be crippling to us, and turning things around for the better, even when by human standards, there seems to be no way out. Which leaves me with ‘Relativity’, ‘While I Wait’ and ‘Everything’, the former being a well delivered and engineered instrumental track, the second being a heartfelt moment of surrendering to God, and allowing the season of waiting to be just that- waiting (and also being content during the waiting and not letting the healing and the finishing rush whatever God wants to accomplish in our hearts during the in-between), and the latter being a radio friendly track re-engineered for K-Love, as we’re reminded that ‘…Your love, is strong enough for me, with me when I’m weak, everything I need is in Your love, constant in the trial, faithful through the night, everything I need is in You…’ There’s even a radio version of ‘Everything’, shown below and compared to the original version…does that mean a potential inclusion into WOW Hits 2019, or even WOW Hits 2020? Maybe, maybe not. Nevertheless, ‘Everything’ is one of my favourite songs on God of the Impossible, perhaps one of my favourite Lincoln Brewster songs ever. And then there’s ‘While I Wait’. Emotive and poignant, heartfelt and reflective, this 5 minute ballad paints a picture of waiting even when circumstances tell us that change, positive change, is too far gone. Waiting on the Lord during a season of trials can be a difficult thing, and ‘While I Wait’ paints a very real struggle we as Christians can often have. It is, in essence; a prayer, for God to draw close during these times, and for us to remain close, especially during seasons of questioning and doubt that we can often go through, at least once in our lives. ‘Relativity’ rounds out the deluxe version of God of the Impossible, which presents to us a powerful and emotive instrumental track- which begs the question- can you still present a song that can be used in a time of worship, but without words? Bethel Music did it with Without Words and Synaesthesia a while back, which proves it can be done. Lincoln’s attempt in ‘Relativity’ will only work if the congregation and those who hear it can worship alongside a lot of noise. Nevertheless, for me I was able to worship alongside it- and maybe, others can as well. We see Lincoln’s trademark guitar work all over the song, which may be a good thing, but it can also be too much as well. Regardless, ‘Relativity’ is a perfect last song, and a definite highlight if you enjoy anything from Lincoln’s in the past, instrumental music, or both! If I have discussed this fact in a roundabout way but never hit the hammer on the head, let me do so now- Lincoln Brewster is a fantastic worship leader with an immense and prolific electric guitar skill that makes his ability to transform worship songs akin to how Stu G. enhances every Delirious? and One Sonic Society track he is on. Giving us equal amounts of enthusiasm, emotion, heart, passion, poignancy and worshipfulness within this new album. While some elements of the choreographed music and lyrical moments in each of the songs work more than others, as a whole, Lincoln’s passion for music and worship has never faded, resulting in an album that can be used in both a corporate and personal worship setting. Well worth the 4 year wait (and despite a few hiccups here and there with lyrical repetitiveness in relation to songs on this album), God of the Impossible is a great follow-up to Oxygen, and is one of my favourite worship albums, as a whole, this year. Well done Lincoln for this encouraging album, looking forward to worshipping alongside these songs in the upcoming weeks/months ahead!